Miss Good on Paper has some great advice for aspiring writers: write, read, and live. Well, the first one is pretty obvious - I mean you can’t spell writer without write, right? Reading is also essential, but if you’re anything like me, you have to be careful. Once I start a book, nothing else gets done (including writing) until I’ve read it cover-to-cover. Lastly, you have to live. I mean, really, who has ever heard of an author who wrote a single word after (s)he was dead? If you don’t live, you can’t write. OK, I’ll admit, that was a bit tongue-in-cheek, but the advice is solid. I think the first thing you have to do (whether you want to be a writer or not) is live. The writing will come later, for most people. There are those few (bastards) who can experience a moment, or event, and know immediately how to put it into words. For the rest of us, live while you can and write in your spare time. Trust me, you’ll be happier and the words will flow more freely than a drunk at five cent beer night. Of course, once you identify it, you’ll need a book and a butterfly net to actually rid yourself of the fella’. 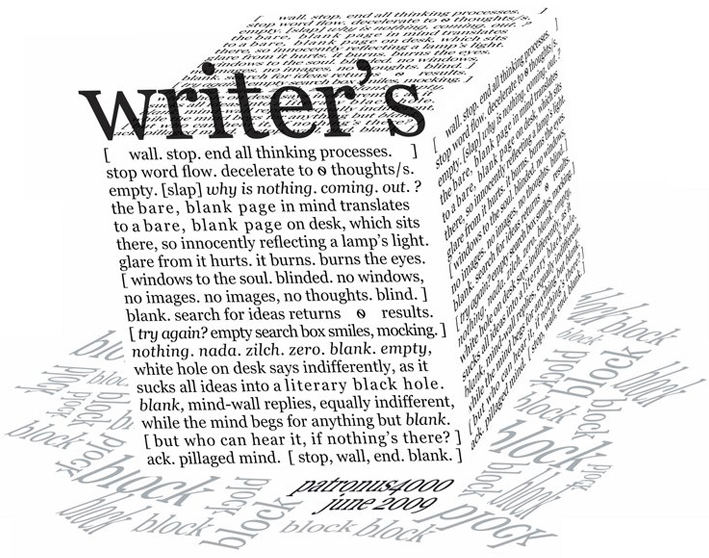 A must read if you’ve ever had (or are currently experiencing) a writer’s block of your own. What Makes A Good Fold? OK so many of our FoldingStory fans have been hesitant to get in and start folding because they’re afraid that they aren’t clever enough to put together a line that people like. I’ll admit, everyone on the FoldingStory team shares this fear. Our avid users have shown surprising creative endurance, and while it probably comes natural to them, we think there are some strategies that you can use to generate ideas on the fly and earn some points. Most of the top folds are in that category because they are funny. We’re not talking stupid funny either, we’re talking REALLY stupid funny. The zanier the better, trust me. Action folds make up almost as much as the funny folds. In some cases there are funny action folds, and these are my personal favorites. If you can move the story along with some block-buster special effects, you’ll find yourself on that leaderboard. Sometimes starting new stories can be your ticket to FoldingStory stardom. These are often easier than you think. Try something that happened to you that day, or perhaps start the story at the middle or end of a situation to get the Memento effect. Most of the top folds include more than just a quick hit-and-run, often times using up as many characters as you can from the number of available ones in each fold. Tell us what you think make up the best folds. We’d love to hear from you! M.J. Rose has an interesting article on self publishing your work. Prompted by Barry Eisler’s decision to turn down a $500,000 deal to publish his next novel himself, Rose discusses her experience in 1998 and how the industry, and perception, has changed since then. On a somewhat related note, have you heard of Amanda Hocking? She is the self published author who is making a killing selling her novels for less than $5 each online. I think we’re in the wrong business. And when they force you to think creatively rather than just pointing and clicking, games have an even greater impact. Writermag.com is offering free access to all of their content for one week only. From noon on March 17, until midnight on March 24 you can access all of their paid content, including articles from The Writer magazine. Visit WriterMag.com to get in on the all the good freebies until the promotion ends. The Ides of March are upon us. Last month FoldingStory was picked up by ReadWriteWeb and TheNextWeb and was featured in a news feed along with stories about Apple, Baidu, Google, Twitter, and Firefox. So keep folding those stories, you're in good company! We’ve received several requests from forward-thinking teachers who would like to integrate social storytelling into the classroom, and we were delighted when blogger/educator Kristian Still experimented using FoldingStory with his year 10 English Functional Skills class. He wrote up a great step-by-step guide and conclusion for trying this in your own classrooms. If you’ve tried this in your classroom please let us know how it went, we would love to hear from you! We’re pleased to announce that in the last month NixonBlack was the first user to reach 1,000 folds and also 1,000 votes! We would also like to give a shout out to MoralEnd for being the only other user to reach this level. We’ve found that the more diverse the authors of a story, the more interesting the final stories turn out to be. Therefore, in an effort to keep the collective ideas flowing and the stories as fresh as possible, we’re currently on a push to break the threshold of 1,000 FoldingStory users. So please be sure to tell your friends and share with the rest of the world how much fun we’re having over here at FoldingStory! Use the links at the bottom of the page to Like us on Facebook or Follow us on Twitter. This month’s Featured Fold was submitted by MoralEnd, whose “Waxen Queen” offers her royal subjects no explanation: “…and performed ‘Rent’ in Spanish. Her Edict demanded that the still life perform all theater works in Spanish because, well…she was the ‘Waxen Queen,’ she didn’t need reasons…” Unless you’re too busy conducting still life Spanish theatre yourself, read the full story here. Want to check out more great folds and see how yours stack up? Check out our Top Folds page.